It’s the antithesis of the modern North American stainless steel super grill (you know, that propane-fired monster with multiple heat zones, infrared sear station and industrial strength rotisserie). But when it comes to providing maximum grilling efficiency in minimal space, few grills can beat its direct, concentrated, blast-furnace heat. It’s the compact Japanese-style tabletop grill known in the West as the hibachi. Without it there would be no yakitori or robatayaki. Get the Yakitori Like They Make It in Japan recipe. For me—having been born in Japan—the hibachi is more than a nostalgic icon. It reminds us how uncomplicated and elemental grilling can be, requiring little more than a vessel to hold and channel the fire, and vents to control the airflow, and thus the heat. The first hibachis (the word means “fire bowl”) were used for indoor heating and for warming water. By the 8th century A.D. you could find hibachis carved from cypress wood and lined with clay. These gave way to ornamental porcelain or ceramic models, which in turn have become the sleek firebrick and steel hibachis used today. Curiously, in Japan you won’t hear the term hibachi used for a grill. The Japanese prefer the terms shichirin or konro. (The former takes its name from the Japanese words for “seven rin”—the archaic cost of a batch of cooking charcoal.) Traditional models resembled large round flowerpots. The best were made from volcanic diatomaceous earth—unsurpassed for retaining and dispersing the heat. Modern yakitori parlors use long, slender, rectangular grills fabricated from firebrick or ceramic. Some come with wire mesh grates (tightly woven to keep small foods from falling into the fire). But in Japan, most have no grates. They rely on a metal bar running the length of the firebox to support the ends of the yakitori and other kebabs. The bare portion of the skewer hangs over the edge, which keeps the bamboo from burning. The finest yakitori parlors use hard, super-premium, super-hot burning charcoal called binchotan. This, aerated with an electric fan, enables the grill master to achieve grilling temperatures as high as 1000 degrees F.
When Japanese-style tabletop grilling came to North America, the grills lost their traditional name (shichirin) and were marketed as hibachis, which was easier for the Western tongue to pronounce. Or maybe it was just a classic case of lost in translation. In any case, hibachi became the common term in the West. And now, it seems more and more people are rediscovering this remarkably efficient little grill. American-made hibachis differ in one key way from traditional Japanese shichirin (also called konro) grills. We fabricate them from metal—typically cast iron. With hibachis, as in so much in life, you get what you pay for. Cheap metal hibachis made in China tend to break or wear out after a couple uses. At a recent session of Barbecue University, we had an opportunity to test drive Japanese and American hibachis side by side. May the best grill win. Provided by the New York-based importer of Japanese culinary products, Korin, along with some genuine binchotan charcoal, the grill burned clean and blisteringly hot as advertised, and made quick work of our spice-rubbed New Shrimp Cocktail. It produces almost equally awesome results with North American natural lump charcoal. On account of its slender firebox, it’s best suited to yakitori and other tiny kebabs. You can order this konro from Korin. The Lodge Sportsman ($95): For years, we’ve been using a heavy, sturdy, squat hibachi made of pre-seasoned cast iron right here in the U.S. by the Lodge Manufacturing Company of South Pittsburg, Tennessee. (The company is best known for its cast iron skillets and Dutch ovens.) The Sportsman, as it’s called, has several ingenious features, including a sliding draft door to allow you to regulate the heat. 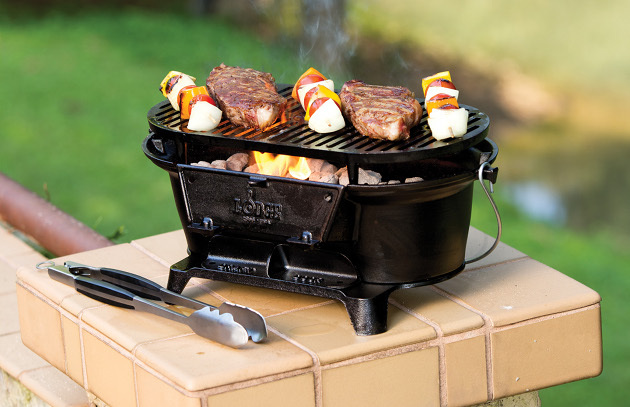 Fresh coals can be added via a drop-down chute. The grill grate (also cast iron) adjusts to two positions. It comes with a handy bale (handle), making it easier to transport (of course, it does weigh 40 pounds). If properly maintained, this rugged little grill will last a lifetime. (That means oiling the grill after use and storing it in a dry place indoors.) 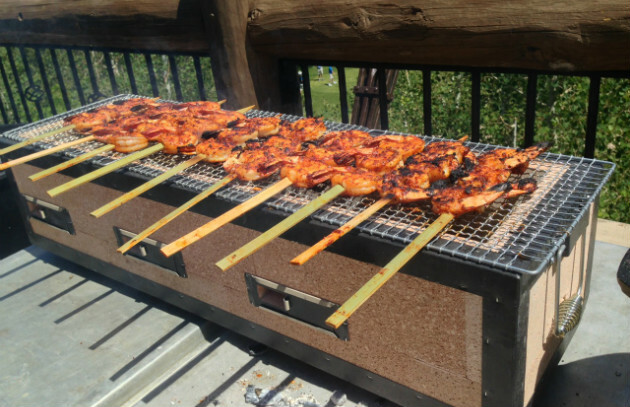 When I have a party, I like to line up several Lodge hibachis on the tables to keep food warm or let guests grill their own yakitori and sates. Available on Amazon. The Kotai Grill Hibachi: Manufactured in my hometown, Baltimore, the Kotai combines the long, slender shape of a traditional Japanese hibachi with the heavy metal firebox of the Lodge Sportsman. Each heavy, handsome grill is welded by hand. The cost is $475 to $800, depending on the size. For more information, go to the Kotai website.